This Irish dinnerware is a set of measuring spoons that feature Celtic crosses along with embossed knot-work. 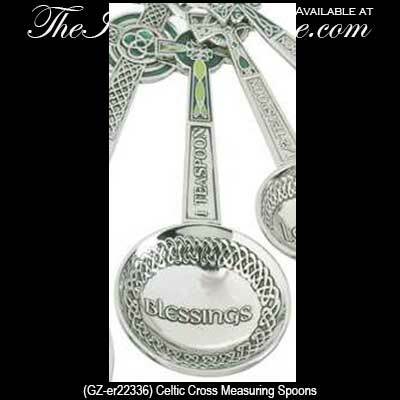 These Celtic Measuring Spoons feature inspiring words. Faith is on the tablespoon. Blessings is on the teaspoon. Love is on the 1/2 teaspoon. Hope is on the 1/4 teaspoon. 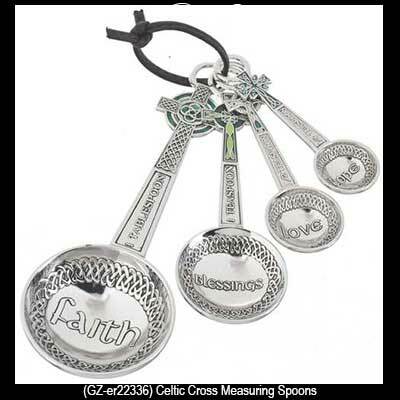 This set of Irish measuring spoons feature Celtic cross handles along with a double sided Celtic knot motif. These Celtic measuring spoons are enhanced with green enamel accenting and are made of silver tone zinc. This Irish dinnerware would make a great gift for any chef; they are gift boxed with Celtic knot and Celtic cross history cards that are complements of The Irish Gift House.